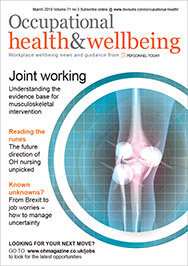 Occupational health teams should be encouraged to get behind the concept of mindfulness, an alternative approach to helping staff cope with pressure experienced in the workplace, says Suzy Bashford. The UK’s first Mindfulness at Work conference, organised by Mindfulnet, took place in February this year. The message from the event was that mindfulness, a meditation-based approach to stress management, can provide an antidote to the relentless pressure and information overload that exists in many UK businesses. It can also help employees thrive under stress and relate better to colleagues or clients. The growing body of evidence in this area (there are approximately 30 to 40 peer-review papers published each month) is compelling and explains the increasing interest in mindfulness business training. Organisations including Transport for London (see case study) eBay, Google, PricewaterhouseCoopers, Prudential, the Home Office, the NHS and London Business School have all launched mindfulness programmes. However, while the conference attracted globally respected speakers such as Mark Williams, professor of clinical psychology at Oxford University, corporate occupational health practitioners were noticeable by their absence. Instead, the push to introduce mindfulness to the corporate environment is typically being led by individuals in senior management, who have personal experience of the benefits. Kenneth Egelund Schmidt, vice-president and chief information officer of Carlsberg’s IT division, has just offered mindfulness training to all of the 400 employees he manages through The Potential Project. Having practised mindfulness for two years, he finds that it helps him deal with the continuous pressure that he experiences. Jon Kabat-Zinn, the founder and developer of the Mindfulness-Based Stress Reduction programme at the University of Massachusetts Medical Centre, defines mindfulness as “paying attention, in a particular way, on purpose, in the present moment, and non-judgmentally”. It is a skill that is honed via meditation (concentrating on a single point of focus, usually breathing) and the greatest benefits are reaped when an individual has a daily meditation practice. Kabat-Zinn’s eight-week course, taught in weekly two-hour sessions, with at least 45 minutes home practice per day, has become the blueprint for the mindfulness model. One of Schmidt’s biggest challenges was getting past misconceptions that mindfulness is synonymous with religion, hippies and sitting in the lotus position and chanting. He explains how he overcame this: “I called a mandatory meeting in work time. “I said: ‘You need to have this information [the scientific argument and research around mindfulness] and afterwards you can choose whether to take a course. It’s your choice. If you’re not motivated, it won’t work’.” Nearly all 400 employees signed up immediately, and feedback so far has been positive. The field of neuroscience has produced some of the most convincing research to draw on when “selling” mindfulness to a business audience. This research uses brain scans to compare what happens when someone is stressed with when they are taking each moment at a time, ie being mindful. When people are stressed, the part of the brain responsible for the “fight or flight” response – the amygdala – goes into a primitive survival mode. In this high-alert state, instead of being able to cope with more activity, the brain actually starts shutting down. It develops tunnel vision, unable to think around a problem, only able to fixate on it agitatedly. Productivity, creativity, innovation, emotional intelligence when dealing with others and flexibility of thinking all plummet (Baldwin M et al, 2010; Arnsten, 2009). Several studies confirm that mindfulness can act as an effective antidote to stress, calming the body down into a more productive state, with one even showing a reduction in the size of grey matter in the amygdala (Hölzel et al, 2010). Another study shows that mindfulness meditation can lower the level of the stress hormone cortisol (Tang et al, 2008). The good news for those interested in corporate mindfulness is that there is growing evidence that participants do not need to practise for long to reap the benefits. Studies have shown that as little as 10 minutes’ meditation, five days a week for four weeks can reduce signs of burnout and enhance wellbeing (MacKenzie et al, 2006; Hölzel et al, 2010). In a related study, by some of the same researchers, novice meditators after the same course showed positive changes in the parts of the brain associated with learning, memory processes, emotion regulation, self-awareness and perspective taking (Hölzel et al, 2011). Mindfulness appears to help individuals manage their emotions more effectively so that negative mind states pass quicker and have less of an impact. It is important to note that mindfulness does not eradicate moods, rather, it gives people tools to deal with them better; a key component of mindfulness is the process of actually experiencing emotions in their entirety. Mindfulnet – information on mindfulness. Be Mindful – the Mental Health Foundation’s mindfulness information website. The Centre for Mindfulness Research and Practice, Bangor University. Mind Body MOT – website of Dr Tamara Russell, a neuroscientist who spoke at the Mindfulness at Work conference. This theory is backed by research among primary care physicians, a group at high risk of burnout, who showed sustained improvements in wellbeing following a mindfulness programme (Krasner et al, 2009). After training, these physicians were also shown to be more empathetic with, and caring of, their patients. Indeed, increased levels of self-compassion and compassion towards others are outcomes that many research studies have picked up on. These may not initially sound like traits useful to the cut-throat business environment; however, there is growing pressure on corporations to act in a socially responsible way, with this proving a source of competitive advantage for some. While there is much research, certain criticisms have been levelled at the type of ­research and the small number of participants involved. While it is useful to look at what happens when people meditate and extrapolate what might happen if you took meditation into the workplace, there is a great shortage of corporate data. As mindfulness increasingly moves from the margins to the mainstream, this situation looks likely to change. Juliet Adams, conference organiser and founder of Mindfulnet, predicts that the next conference, which is planned for 2013, will feature many more concrete case studies. If mindfulness does continue to rapidly gain credibility as a powerful way to enhance workplace wellbeing, then OH professionals need to lead this charge from the front, rather than lagging behind, as is the case at the moment. Arnsten AFT (2009). “Stress signalling pathways that impair prefrontal cortex structure and function”. Nature Reviews Neuroscience 10, pp.410-422. Baldwin M, Way J, Creswell D (2010). “Dispositional mindfulness and depressive symptomatology: correlations with limbic and self-referential neural activity during rest”. American Psychological Association, vol.10, no.1, pp.12-24. Hölzel BK, Carmody J, Karleyton C, Evans KC et al (2010). “Stress reduction correlates with structural changes in the amygdala”. Social Cognitive and Affective Neuroscience 5, no.1. Hölzel BK, Carmody J, Vangel M, Congleton C, Yerramsetti SM, Gard T, Lazar SW (2011). “Mindfulness practice leads to increases in regional brain gray matter density”. Psychiatry Research: Neuroimaging vol.191, issue 1, pp.36-43, 30 January 2011. Krasner MS, Epstein RM, Beckman H, Suchman AL, Chapman B, Mooney CJ, Quill TE (2009). “Association of an educational program in mindful communication with burnout, empathy, and attitudes among primary care physicians. MD Clinician’s Corner JAMA. 2009; 302(12): pp.1,284-1,293. doi: 10.1001/jama.2009.1384. MacKenzie CS, Poulin PA, Seidman-Carlson R (2006). “A brief mindfulness-based stress reduction intervention for nurses and nurse aides”. Applied Nursing Research 19 pp.105-109. Tang YY, Posner MI (2008). “The neuroscience of mindfulness”. The Neuroleadership Journal 1: pp33-37. Woods W. Meditating at Work: A New Approach to Managing Overload. This book references some good US corporate examples. Counselling at Work magazine, Autumn 2011. Prof Williams M, co-authored with Penman D (2011). Mindfulness: A practical guide to finding peace in a frantic world. Piatkus. The Mental Health Foundation 2010 report on mindfulness. Alison Dunn says: “Bringing mindfulness into the workplace back in 2004 was a bit of a leap of faith. We wanted to introduce an intervention that would provide an additional dimension to the support we were already offering employees. Counselling is a great solution for a whole range of people and problems, but we felt that we needed to provide something more active and direct for employees experiencing symptoms of stress. This six-week programme – which incorporates cognitive behavioural therapy and other techniques as well as mindfulness – aims to guide people in mastering their symptoms, help them understand the stress cycle and how to interrupt it, and enable them to develop a healthier approach to life. The metaphor we use and the name for the programme is ‘Riding the Wave’. We say that stress management is like learning to surf. You can’t stop the waves, but you can learn to surf them effectively. The biggest challenge was dealing with the myths and preconceptions. We just have to keep talking to people and explaining, and let the results speak for themselves. We don’t use the word meditation that much either, we talk much more about relaxation. Since 2009, around 600 Transport for London (TfL) employees have been through the programme and qualitative evaluation shows that, immediately afterwards, nearly all employees said that they made changes to their lives as a result. Among employees who have attended the course, the number of days off for stress, anxiety and depression fell by 71% over the following three years, while absences for all conditions dropped by 50%. There are also qualitative improvements, with 80% of participants reporting improvements in their relationships, 79% improvements in their ability to relax, 64% improvements in sleep patterns and 53% improvements in happiness at work. One of the most attractive things about mindfulness at TfL, from an OH point of view, is that colleagues kept improving on key measures a long time after the point of intervention. “On average, not only is there a significant improvement in the first year, but there are further slight improvements in years two and three, sustained much beyond intervention,” says Dunn. For more information visit the Human Resilience website. If you drive to work, take a few moments when you first get into your car just to notice your breath and your body. When you have a break, instead of reading the paper or searching on the internet, get away from your computer – take a short walk and get outside if you can. At lunchtime, turn off your phone and get some air. Pause. If you meet with colleagues over lunch, try talking about things other than work. Before heading home, review the day. Acknowledge what you’ve achieved, make a list of what you need to do tomorrow and, if you can, put your work down. Change out of your work clothes soon after you get in and make a point of greeting everyone at home in turn. If you live alone, feel what it is like to enter the quiet space of your own home. The Mindful Workplace (Wiley-Blackwell, 2011), by Michael Chaskalson, CEO of Mindfulness Works. XpertHR offers a line manager briefing that provides guidance on how to prevent stress and help employees cope with stress and a good practice guide on stress management. The meditation done properly will also increase one self awareness and cause workers to make less mistakes. There are so many positives to the meditation.